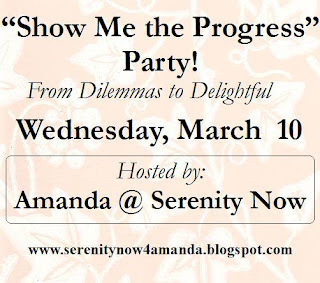 The very first Show Me the Progress party is still going on! The linky thingamajig will be open until this evening at 5 pm (ET) and I'd love for you to join us if you haven't already. Click the aforementioned link, or scroll down to yesterday's post to check out everyone's amazing Progress! There are around 40 links right now....for a random little blog like mine, I'd call that a success! If you joined the party, please be sure you have visited a few of the other links. That's the only way a blog party can be successful. Be sure to let the person you're leaving a comment for know that you're stopping by from the "Show Me the Progress" party. Hopefully, they'll pay you a return visit! 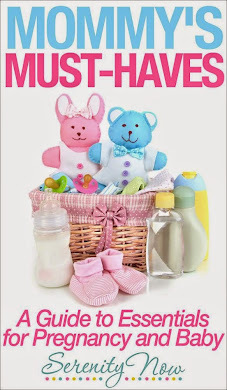 Thanks to everyone who has linked up and left such lovely comments on all the blogs---I do notice that stuff! 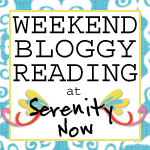 Check back in tomorrow for some Weekend Bloggy Reading, the winner announcements, some highlights from the party, and a few announcements about fun stuff coming up here at Serenity Now! Amanda, it has been a fabulous party...I think I'm a bit hung over...just a little too much blog hopping and late hours. But talk about fun! Everyone is thinking and doing such great stuff! I have seen lots of things I'm going to steal, um..., copy..., um... be inspired by, yeah, that's it. Thanks for hosting! Oh I'm so sad I don't have some pretty progress to show! Everyone's completed projects look so amazing. But I did gain some great decor ideas and inspiration in other spaces. That dang wall is going to be the death of me. Maybe I should just knock it down, ha! Thanks for hosting the party Amanda! It was great to see everyone's progress. You are such a good hostess! I miss you! I'm sorry I'm a loser! This week has been a joke...I'll tell ya about it sometime. But really, really sorry I missed the party! Such a good turnout! I added a lot of the blogs to my book marks.. you know since my followers don't work! :P Blogger...grr..
Love it though, everyone did such a good job. and, un related to that, you're right the bag does look like your background!